Playing games is meant to be a fun and entertaining activity, but we do understand that some players may find it difficult to control their habit and this in turn may lead to behaviour which may be unsafe for them. At Rummy Passion, we take steps to make sure that all our players enjoy safe, secure and responsible gaming. We are committed to helping players who wish to control the amount that they play. You must be 18+ to play real money rummy. Rummy is a game of skill. Winning cash is dependent on the skill of an individual in regards to the game of Rummy. Play responsibly. Rummy Passion has a stringent policy against underage players (aged below 18 years) and such players when found will immediately be removed. We also strongly recommend that our players employ child protection software to safeguard their children. The use of passwords and close supervision of user account activity helps in limiting improper and reckless usage of the internet. How you, the player can help? 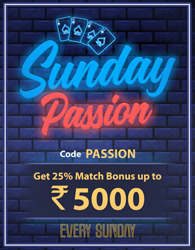 Rummy Passion encourages all its players to play responsibly. Players can request for their accounts to be temporarily blocked or reduce their deposit limits, if they want to self-exclude themselves for some time. Our customer support representatives are there to help you with any help you may require. Please feel free to Contact Us.